This form is a real estate purchase agreement for an all cash acquisition of a luxury golf course including the land and the improvements by an investor. It is essentially a financing transaction. The seller tenant will continue to operate the golf course following the sale by leasing back the golf course from the purchaser investor pursuant to a lease. This companion lease to this purchase agreement is available as LA1625. The purchaser and its agents, consultants and employees have the right to perform physical inspections on the property, as well as examine permits, operating statements, tax bills, etc. concerning the property. Prior to closing, the seller may not make any material structural alterations or additions to the property except as (a) in the ordinary course of operations, (b) required for maintenance and repair or (c) required by any of the leases or other agreements; (ii) sell, transfer, encumber or change the status of title of all or any portion of the golf course; (iii) change or attempt to change, directly or indirectly, the current zoning of the property in a manner materially adverse to it; or (iv) cancel, amend or modify, in a manner materially adverse to the property, any license or permit held by seller with respect to the property or any part thereof which would be binding upon purchaser after the closing. The seller makes extensive representations and warranties concerning the property and seller's authority to enter into the transaction in the agreement, and the purchaser makes representations and warranties concerning its power and authority to enter into the sale, its independent investigation of the property, absence of bankruptcy events, etc. 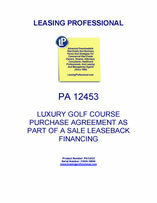 This Sale, Purchase and Escrow Agreement (this "Agreement"), dated as of _______, 20__ (the "Effective Date"), is made by and among GOLF COURSE LAND HOLDINGS, a _________ corporation ("Landowner"), GOLF IMPROVEMENTS HOLDINGS, a _________ corporation ("Improvements Owner"" and collectively with Landowner, "Seller"), and GOLF COURSE INVESTMENT CORPORATION, a _________ corporation ("Purchaser"), and constitutes (i) a contract of sale and purchase between the parties and (ii) an escrow agreement among Seller, Purchaser and PRETTY GOOD COMMERCIAL TITLE, INC. ("Escrow Agent"), the consent of which appears at the end hereof. A. Landowner is the owner of the Land (as defined below) and Improvements Owner is the owner of the Improvements (as defined below). B. Subject to the terms and conditions set forth in this Agreement, Seller desires to sell to Purchaser and Purchaser desires to purchase from Seller, the Golf Course (as defined below). NOW, THEREFORE, in consideration of the premises and of the mutual covenants of the parties hereinafter expressed, it is hereby agreed as follows. 1.1.3 All of Seller’s right, title and interest in and to all intangible personal property relating solely to ownership and operation of the Land and Improvements, excluding the Excluded Assets, but including approvals and permits belonging and appertaining to the Real Property, plans and specifications pertaining to the Improvements, all "__________" trademarks and any other words, names, devices, symbols, logos, slogans, designs, brands, service marks, trade names, other distinctive features, or any combination of the foregoing, whether registered or unregistered, used by Seller in connection with the ownership and operation of the Land and Improvements, including the goodwill pertaining thereto. 1.1.4 All of Seller’s right, title and interest in and to (i) all assignable equipment leases, service contracts, management agreements and other contracts and agreements listed and described on Exhibit C relating to the upkeep, repair, maintenance or operation of the Land, Improvements or Personal Property which will extend beyond the Closing Date (as defined in Section 6.1) and (ii) all assignable existing warranties and guaranties issued to Seller in connection with the Improvements or the Personal Property (collectively, the "Contracts"). 1.2.6 Working capital associated with or set aside with respect to the Golf Course. 1.3 Golf Course Defined. The property described in Section 1.1 is referred to collectively as the "Golf Course." 2.1 Price. Seller shall sell and Purchaser shall purchase the Golf Course for a total purchase price of _____________ Dollars ($_________) (the "Purchase Price "), as allocated, pursuant to the agreement of Seller and Purchaser, between real and personal property in accordance with Schedule 1 attached hereto and made a part hereof. Purchaser shall, at least two (2) business days prior to Closing (as defined below), deliver to Escrow Agent, by bank wire transfer of immediately available funds, a sum equal to the Purchase Price. 3.1.1 Performance by Seller. Performance in all material respects of the obligations and covenants of, and deliveries required of, Seller hereunder. 3.1.2 Delivery of Title and Possession. Delivery at the Closing of (i) the Deed (as defined in Section 4.2.1) and other documents to be delivered by Seller pursuant to Section 4.2 below, and (ii) possession as provided in Section 15.1. 3.1.3 Title Insurance. Delivery at the Closing of the current form of American Land Title Association extended coverage owner’s policy of title insurance (the "Title Policy"), or an irrevocable commitment to issue the same issued by ________ Title Insurance Company (the "Title Company"), consistent in all material respects with a commitment for title insurance issued by Title Company, together with copies of all documents referred to as exceptions therein, containing as encumbrances only those certain encumbrances described in the Deed (as defined below) as "Permitted Encumbrances" and those certain encumbrances described in the New Easements (as defined below) (collectively, the "Title Commitment"). 3.1.4 Seller’s Representations. The representations and warranties by Seller set forth in Section 11.1 being true and correct in all material respects as of the Closing. 3.1.6 Lease Agreement. Execution and delivery by ________ of a lease agreement (the "Lease Agreement"), wherein it will lease the Golf Course after the Closing Date, substantially in the form attached hereto as Exhibit E.
(a) Execution and delivery by Landowner of a license agreement (the "Seller’s License Agreement"), wherein certain intellectual property rights associated with the "__________" name will be licensed to Purchaser, substantially in the form attached hereto as Exhibit F.
(b) Execution and delivery by Purchaser of a license agreement (the "Purchaser’s License Agreement"), wherein certain intellectual property rights associated with the "__________" name will be licensed to Landowner (or Improvements Owner), substantially in the form of Exhibit G.
(c) The Seller’s License Agreement, and the Purchaser’s License Agreement, are hereinafter sometimes collectively called the "License Agreement." 3.1.8 Partial Assignment and Assumption of Second Amended and Restated Golf Course Use Agreement. Execution and delivery by Landowner (or an affiliate) of a Partial Assignment and Assumption of Second Amended and Restated Golf Course Use Agreement (the "Partial Assignment and Assumption of Second Amended and Restated Golf Course Use Agreement"), the terms, substantially in the form attached hereto as Exhibit H.
3.1.9 Water Delivery Agreement. Execution and delivery by Landowner of an Agreement for the Delivery of Water (________ Golf Course) (the "Water Supply Agreement ") pursuant to which water for use in the operation of the Golf Course will be provided, substantially in the form attached hereto as Exhibit I. 3.1.10 Golf Facilities Easement. Execution and delivery by Landowner of a Grant of Easement (Golf Course Facilities) regarding the use of the Maintenance Facility, Storage Facility and Dumping Ground on ______ (the "Golf Facilities Easement") in substantially the form attached hereto as Exhibit J. 3.1.11 Assignment of Easements. Execution and delivery by Landowner of an Assignment of Easements and Agreements regarding the STP easement, the golf path encroachment agreements and other easements (the "Assignment of Easements") in substantially the form attached hereto as Exhibit K.
3.1.12 CC&Rs. Execution and delivery by Landowner of covenants, conditions and restrictions regarding future utility and similar easements and restrictions on the use and development of the Golf Course (the "CC&Rs"), in substantially the form attached hereto as Exhibit L.
3.1.13 Right of First Offer. Execution and delivery by Landowner of a right of first offer agreement (the "ROFO Agreement") with respect to that certain golf course commonly referred to as "_________ Course" and all improvements, structures and fixtures thereon in substantially the form attached hereto as Exhibit M.
3.1.14 Right of First Refusal. Execution and delivery by Landowner of a right of first refusal agreement (the "ROFR Agreement") with respect to the Golf Course and all improvements, structures and fixtures thereon in substantially the form attached hereto as Exhibit N.
3.1.15 Assignment of Contracts. Execution and delivery by Landowner and Improvements Owner of an Assignment of Contracts (the "Assignment of Contracts") in substantially the form attached hereto as Exhibit O. 3.1.17 Related Agreements. The execution and/or delivery by Seller, as applicable, of those certain agreements listed in Section 4.2 below. 3.1.18 Post-Closing Agreement. Execution and delivery by Landowner of a Post-Closing Agreement (the "Post-Closing Agreement") in substantially the form attached hereto as Exhibit Q. 3.1.21 Association Estoppel Certificates. Two (2) copies of an estoppel certificate executed by the __________ Resort Association (the "__________ Resort Association Estoppel Certificate") substantially in the form of Exhibit T-1 attached hereto and two (2) copies of an estoppel certificate executed by the __________ Estates Lot Owners’ Association (the "__________ Estoppel Certificate") substantially in the form of Exhibit T-2 attached hereto. 3.1.22 Nondisturbance Agreement. Execution and delivery of a Nondisturbance Agreement executed by Pretty Good Bank, N.A. with respect to the Water Supply Agreement and the ______ Agreement (the "Nondisturbance Agreement") in substantially the form attached hereto as Exhibit U . 3.1.23 Reliance Letter. Execution and delivery of a reliance letter executed by ____________ (the "Reliance Letter") in substantially the form attached hereto as Exhibit V.
3.1.24 Will Serve Letter. Execution and delivery of a "will serve" letter (the "Will Serve Letter") signed by __________ Water Company, Ltd. in the form of Exhibit W.
3.1.25 Agreement Regarding __________ Club. Execution and delivery by Landowner of a Golf Course Use Agreement (__________ Club) (the "Agreement Regarding __________ Club") in substantially the form attached hereto as Exhibit X. 3.1.26 Mortgage Release. Execution and delivery of a recordable partial release of that certain mortgage in favor of Pretty Good Bank, N.A. affecting the Real Property. 3.1.27 UCC-1 Termination. Execution and delivery of a UCC amendment terminating that certain Wells Fargo UCC-1 Financing Statement in favor of Pretty Good Bank, N.A. as to the Golf Course. 3.1.28 New Easements. Execution, delivery and recordation of the following new easements (collectively, the "New Easements"): (a) Grant of Underground Waterline Easement from Seller to __________ Water Company, Ltd., affecting certain existing designated waterline easements within the Land in substantially the form attached hereto as Exhibit EE-1; (b) Grant of Reservoir, Waterline and Well Development Easement from Seller to Purchaser in substantially the form attached hereto as Exhibit EE-2; (c) Grant of Underground Waterline Easement from __________ Club Associates to Purchaser in substantially the form attached hereto as Exhibit EE-3; (d) Grant of Underground Waterline Easement from ______________ to Purchaser in substantially the form attached hereto as Exhibit EE-4; (e) (Reserved); (f) Grant of Drainage Easement from Seller to Purchaser in substantially the form attached hereto as Exhibit EE-6; (g) Grant of Drainage Easement from __________ Club Associates to Purchaser in substantially the form attached hereto as Exhibit EE-7; (h) Grant of Drainage Easement from Improvements Owner to Purchaser in substantially the form attached hereto as Exhibit EE-8; (i) Grant of Drainage Easement from Purchaser to Seller in substantially the form attached hereto as Exhibit EE-9; and (j) Grant of Trail Easement from Purchaser to __________ Resort Association in substantially the form attached hereto as Exhibit EE-10. 3.1.29 Side Letter Regarding Lease. Execution and delivery by ________ Golf LLC of a side letter regarding the Lease extension (the "Lease Side Letter") in substantially the form attached hereto as Exhibit FF. 3.2.1 Performance by Purchaser. Performance in all material respects of the obligations and covenants of, and deliveries required of, Purchaser hereunder. 3.2.2 Receipt of Purchase Price. Receipt of the Purchase Price and any adjustments due Seller under Article 7 at the Closing in the manner herein provided. 3.2.3 Purchaser’s Representations. The representations and warranties by Purchaser as set forth in Section 11.2 being true and correct in all material respects as of the Closing. 3.2.4 Related Agreements. The execution and/or delivery, as applicable, by Purchaser of those certain agreements listed in Section 4.1 below.